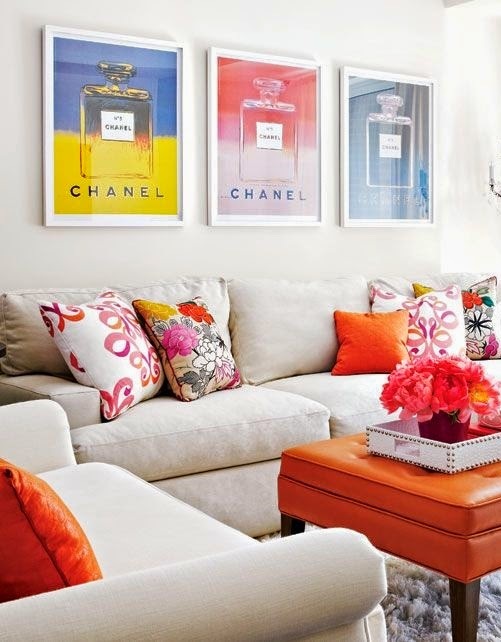 Lush Fab Glam Inspired Lifestyle For The Modern Woman: Transition From Summer To Fall With Orange Decor. Transition From Summer To Fall With Orange Decor. It feels like the summer months are just flying by and since we want to hold on to those sunny, bright and fun-filled days of summer for as long as we can. We are exploring fabulous ways to bring the jovial spirit of summer into our living spaces with bold and beautiful orange home decor. 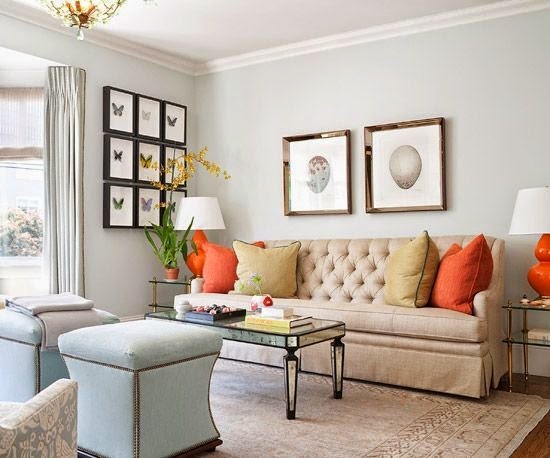 Orange cushions and side table lamps take this neutral beige and pale blue living room from drab to fab. An orange tufted center table and small orange cushions are used to ground this room and create a focal point amid it's eclectic floral themed decor. 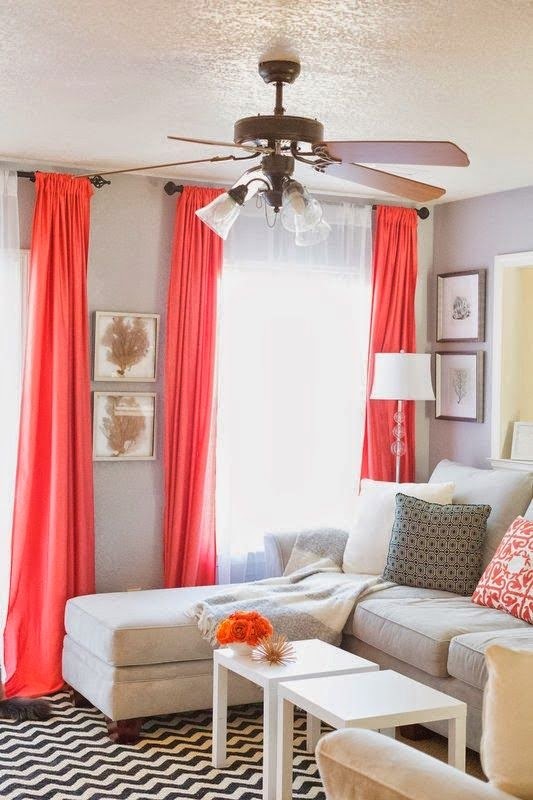 A room with grey walls and furniture gets a stylish makeover with the simple addition of orange window curtains and graphic orange throw pillow and a small orange flower bouquet. Bedroom: Your bedroom is where you go to unwind at the end of a long day not only should it be comfortable, cozy and relaxing but it should also have romantic flair. 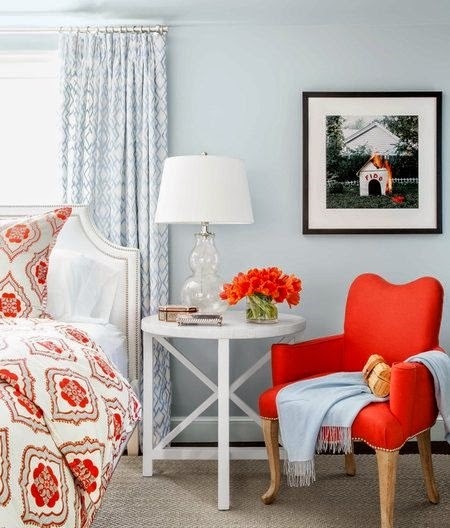 Go bold with a graphic orange comforter set and orange accent chair like in image 1 below. Or use more subtle pops of color like an orange throw and pillows, flowers and books on the night stand like in image 2 below. An orange patterned comforter set and orange accent chair make add pizzazz to this bedroom. An all white bedroom gets a romantic makeover with orange throw pillows, books and flowers. 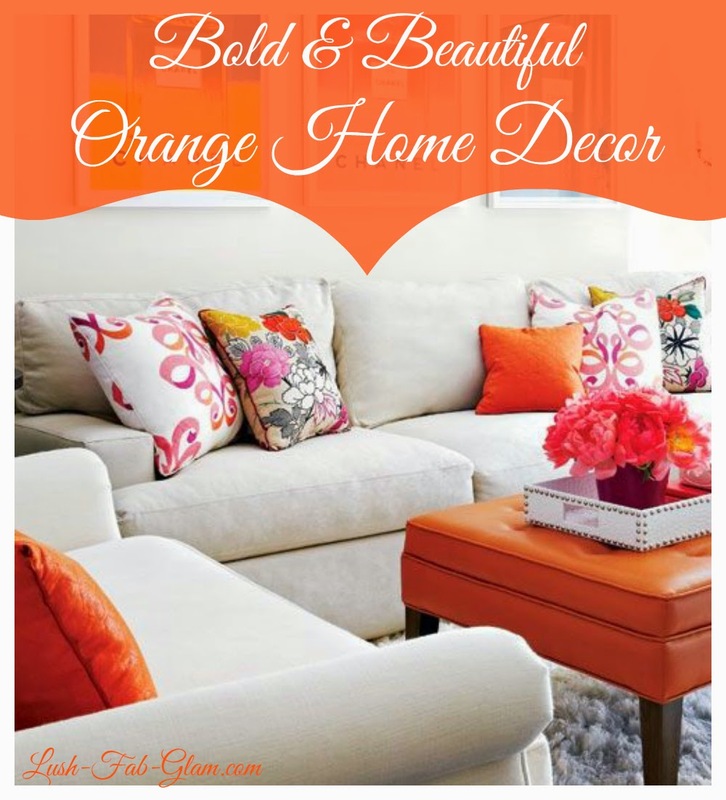 Which featured orange themed home decor do you love and which room in your home would you makeover? Share with us by leaving a comment below.